Pumpkin is one of my favorite ingredients to work with. 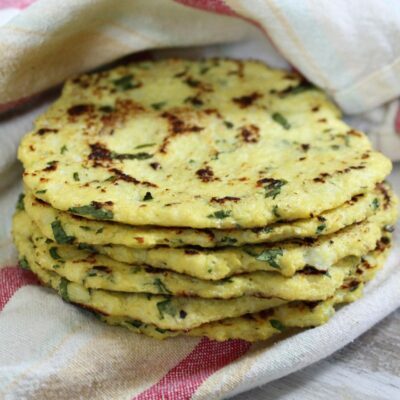 It’s such a versatile ingredient that adapts well to sweet or savory dishes. From pumpkin chili to pumpkin French toast casserole, there are countless ways to incorporate pumpkin into your fall menu. 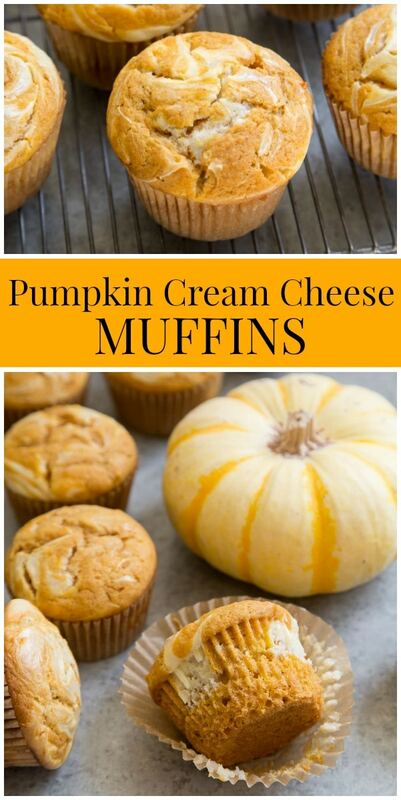 Let’s kick of pumpkin season with a easy favorite- pumpkin cream cheese muffins! 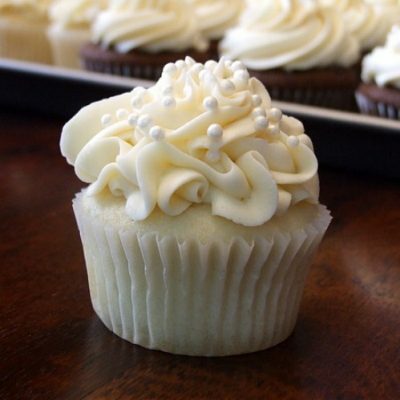 These are special because of that luscious cream cheese swirl topping. These muffins are quick and easy to make and sure to please a crowd. Best of all, this recipe makes a little over a dozen. 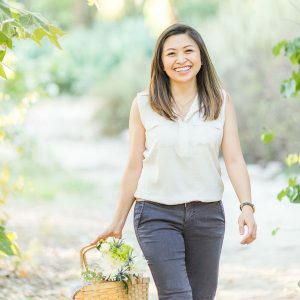 Meaning, you’ll have a couple to save for yourself and still have a full dozen to share or giveaway to others. Muffins are usually made with a neutral flavored oils like vegetable or canola oil. Oil is 100% fat with no water. As a result, you get moist muffins. 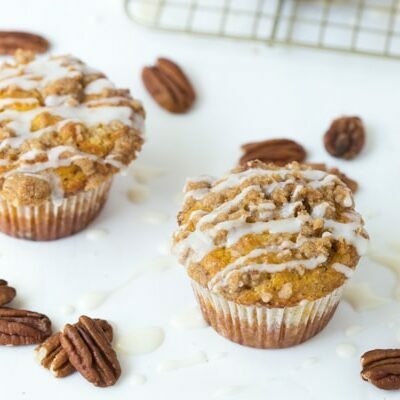 This pumpkin muffin recipe uses a combination of melted butter and vegetable oil. Unsalted butter is made from a combination of about 80% milk fat, 18% water, and 2% milk solids. 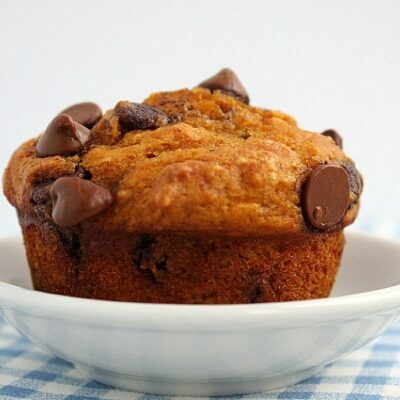 Those milk solids help to add a bit more flavor and richness to the muffins. Fill the muffin tin about half full of pumpkin batter. Add three dollops of the cream cheese mixture. Follow with three dollops of pumpkin batter between the cream cheese. Use a chopstick, butter knife, or mini offset spatula to swirl together the dollops. 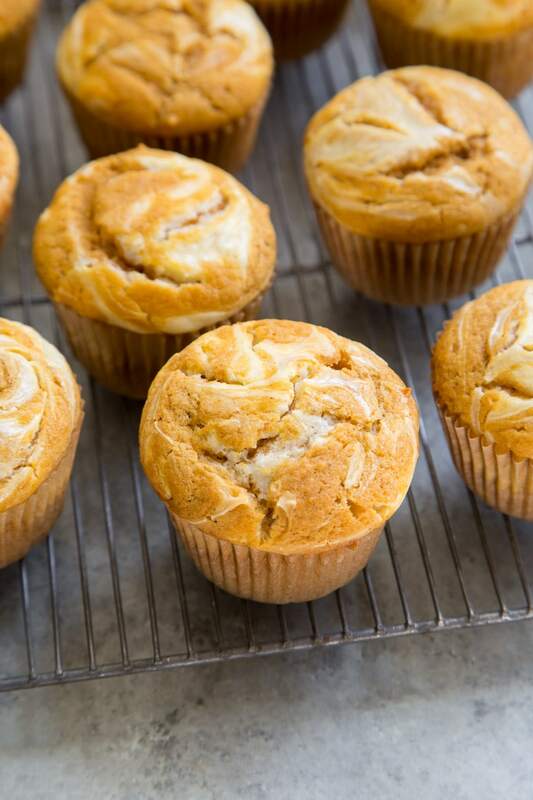 Alternatively, if you want the cream cheese swirl throughout the entire muffin, fill the muffin tin a little over a quarter (1/4) full with pumpkin batter. 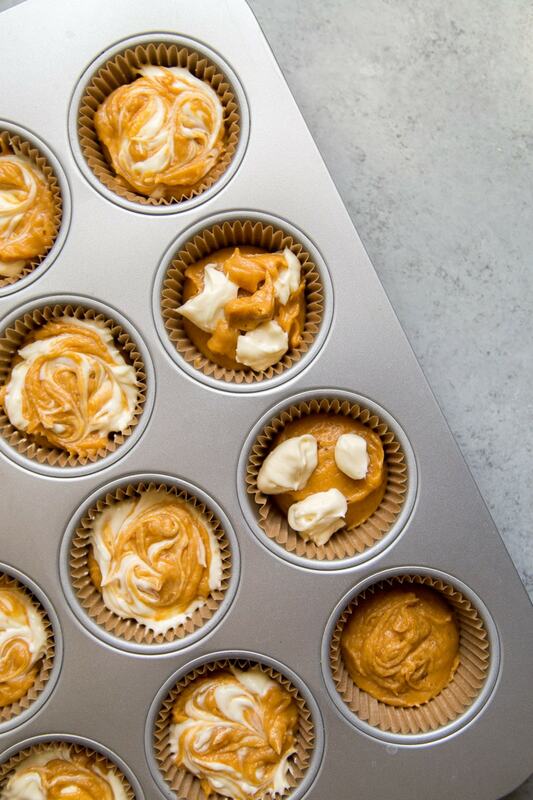 Add the dollops of cream cheese and pumpkin batter in two additions until the muffin tin is about 3/4 full of batter. 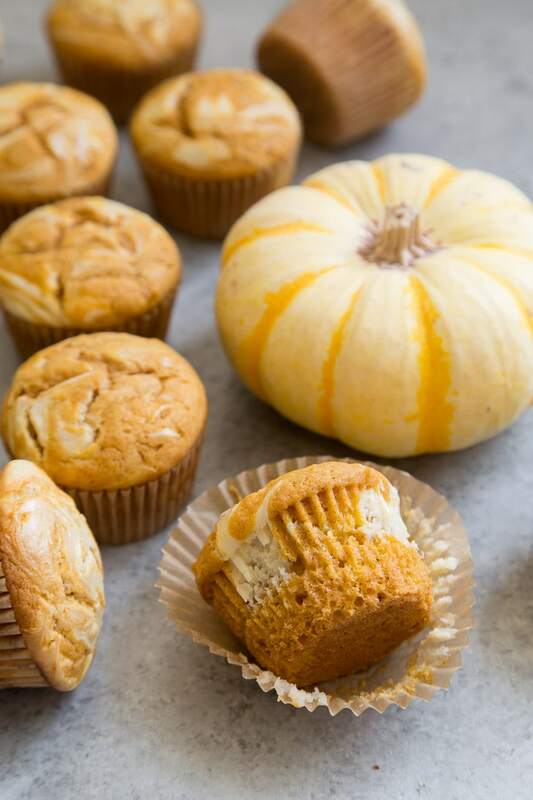 These pumpkin cream cheese muffins get a kick of flavor from pumpkin pie spice mix. The store-bought spice mix is usually a combination of cinnamon, nutmeg, cloves, all-spice, and ginger. Alternatively, you could simply pick one spice to shine- such as cinnamon. I prefer the mixture of spices because it creates such a warm and iconic fall flavor. 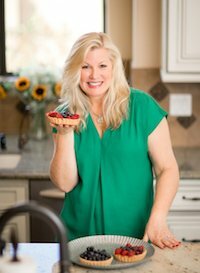 If you’re interested in more muffin recipes, you might enjoy these easy Apple Cinnamon Muffins, Whole Grain Blackberry Spice Muffins, or Morning Glory Muffins. 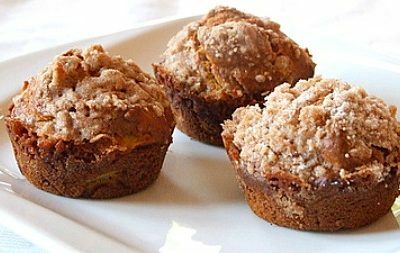 These muffins use a combination of pumpkin puree, butter, and oil to produce a moist and flavor baked treat. 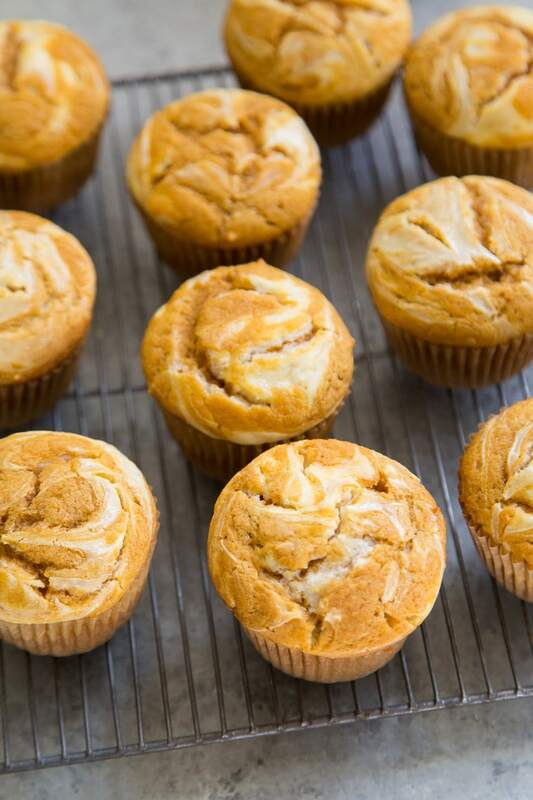 Topped with a cream cheese swirl, these pumpkin muffins are great with coffee or tea. Preheat oven to 350 degrees F. Line the muffin tin with paper liners and set aside. In the bowl of a stand mixer fitted with a paddle attachment (or using an electric hand mixer), beat together the butter, oil, brown sugar, white sugar, eggs, and pumpkin puree until smooth. In another bowl, whisk together the flour, pumpkin pie spice, baking powder, salt, and baking soda. Add the flour mixture to the mixing bowl. Mix on slow speed until well combined. Scrape down sides of the bowl as needed to ensure thorough mixing. Set aside. Using an electric hand mixer, beat together the cream cheese and sugar until the mixture is smooth. Add the egg, vanilla and salt. Mix until just combined. 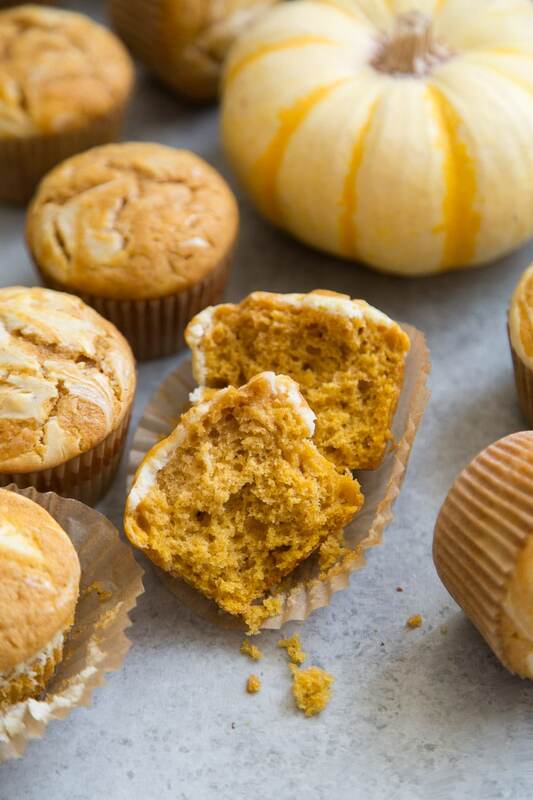 Fill the prepared muffin tins with a little over half full of pumpkin batter. Add three dollops of cream cheese (about 1 teaspoon each). Add three dollops of pumpkin batter (about 1 teaspoon each). Use a chopstick, butter knife, or mini offset spatula to swirl together the batter. At this point, the muffin tin should be 3/4 full. Bake for 23 to 25 minutes, until a toothpick inserted into the center of a muffin comes out clean. Allow the muffins to cool in the tins for 3 to 5 minutes before unmolding. Transfer to a wire rack to cool to room temperature. These muffins can be enjoyed warm or at room temperature. Muffins will keep at room temperature in an airtight container for two days. For longer storage, keep in an airtight container in the fridge for two additional days. To make your own pumpkin spice mix: combine 1/2 teaspoon ground cinnamon, 1/4 teaspoon ground nutmeg, 1/8 teaspoon ground cloves, and 1/8 teaspoon all-spice, and a tiny pinch of ground ginger. 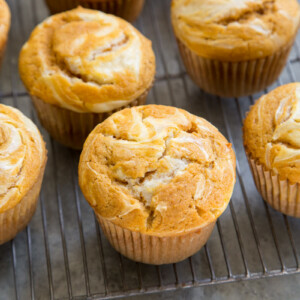 To make make cream cheese swirl throughout the entire muffin: fill muffin tin a little over a quarter full with pumpkin batter. Add three dollops each of cream cheese and pumpkin batter. Swirl. Add another three dollops each of cream cheese and pumpkin batter. Swirl. At this point, muffin tin should be about 3/4 full. These muffins look delicious, but are very dense and lacking in flavor. 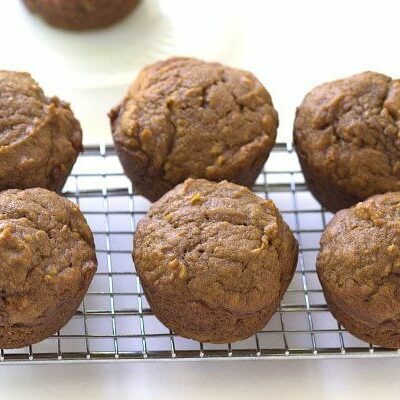 Your “best pumpkin bread recipe” is far better and works wonderfully for muffins! Those cream cheese swirls are beautiful! Such a great flavor combo too! These muffins sound deliciously creamy…so perfect for the season. These have the perfect amount of cream cheese swirl! I have everything I need to make these on hand RIGHT now! Thank you for detailed instructions. Love it !